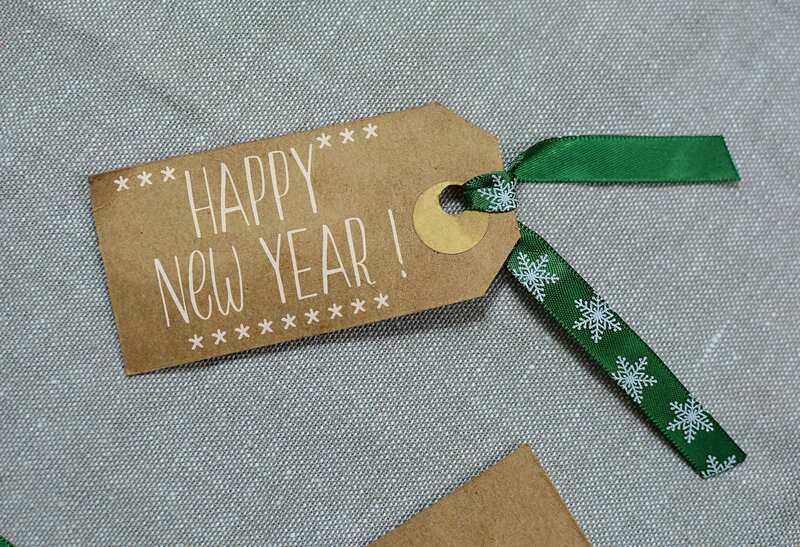 We would like to wish you and your family a Happy New Year! We are excited about all of the opportunities and events that 2019 is bringing us. 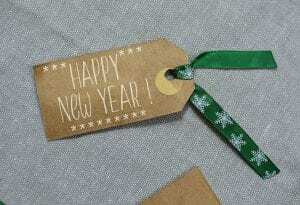 Our office will be closed on Tuesday, January 1st but we will be open again for normal hours on January 2nd. Save the Date: We will be hosting our annual Discover 4-H open house on the morning of Saturday, February 2, 2019. 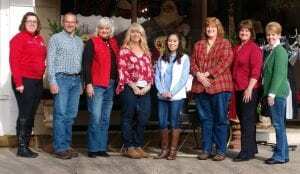 If you know of anyone interested in joining 4-H, this is a great opportunity for them to meet clubs/advisors, browse projects and learn more about what 4-H has to offer. It is also a great opportunity for existing members to browse projects and ask questions to advisors and volunteers who work with those projects. More details to come! Be a Champion for 4-H Camp Ohio! 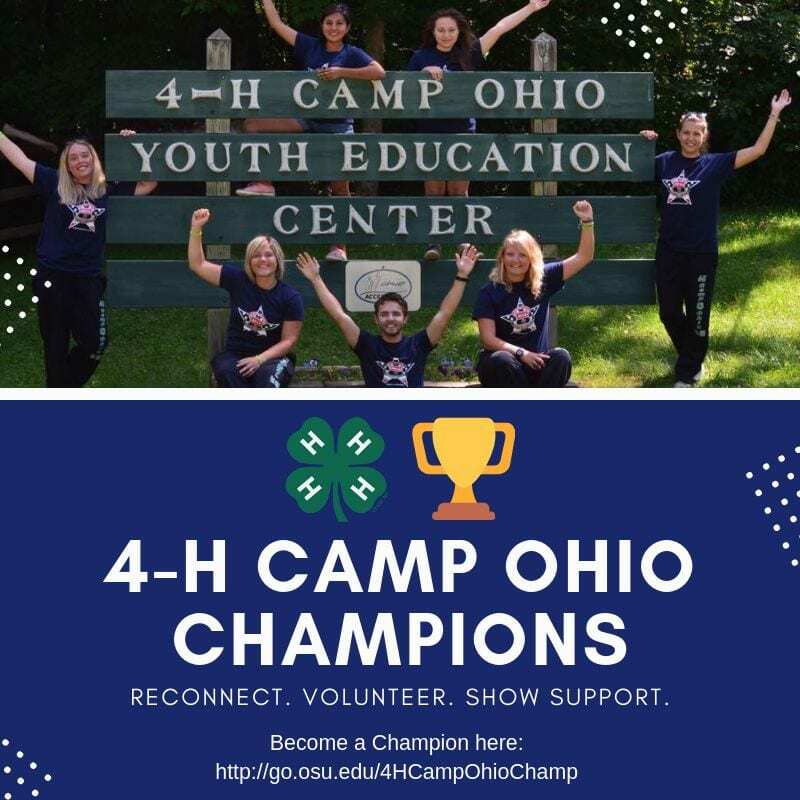 Join the 4-H Camp Ohio Champions by connecting with us! 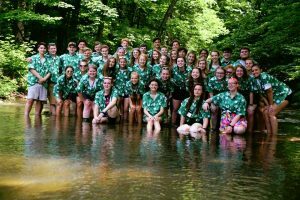 Individuals who have a passion for 4-H Camp Ohio can complete a survey to provide us with how you want to stay connected with camp. Do you want to receive our newsletter? Volunteer? Come to events at camp? Share your camp stories or photos? Make a donation? Something else? Tell us by completing the survey! The link to the survey is here: 4-H Camp Ohio Champions. 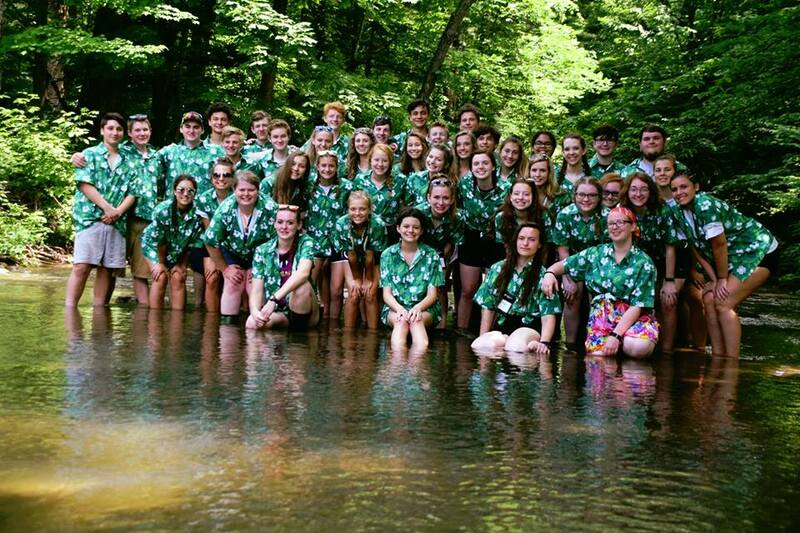 Please share this survey with other individuals who may be interested in connecting with 4-H Camp Ohio and joining other 4-H Camp Ohio Champions! 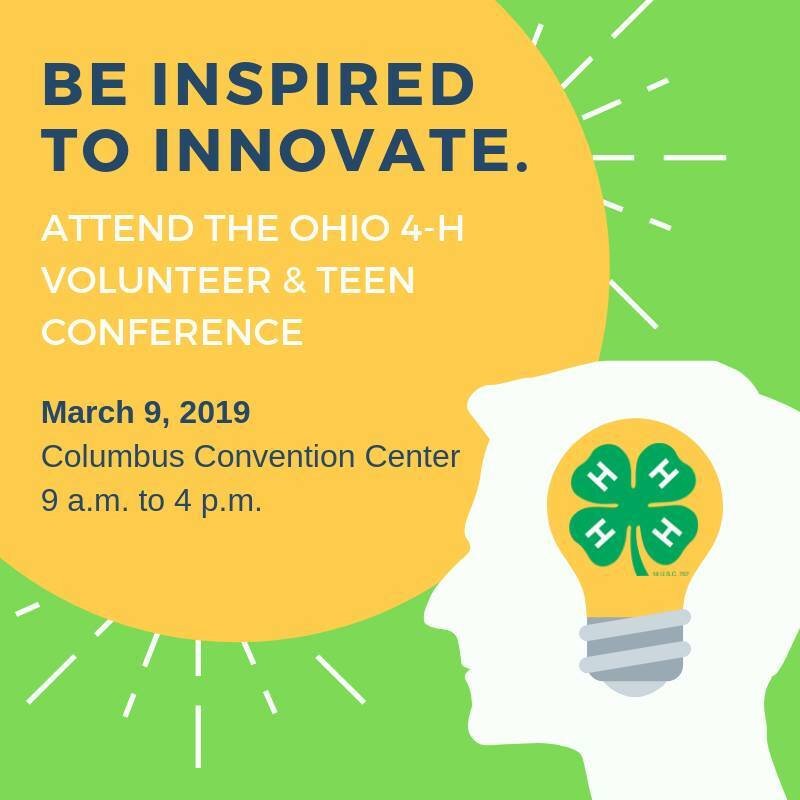 The 2019 Ohio 4-H Conference will be held on Saturday, March 9, 2019 at the Greater Columbus Convention Center in Columbus, Ohio. This conference is a great opportunity for both 4-H members and advisors to gain new ideas, skills and updated information for the upcoming 4-H year. 4-H members and advisors from all over Ohio will be attending and there will be a variety of sessions offered to meet the interests of all attending. When you complete your registration form, please notice a few things… You will need to list your top three choices for each session / workshop that you choose. You will also want to select either sessions OR workshops, but not both – as the times overlap. Once your registration form is completed, you will need to submit the form, as well as $40 (check payable to Licking County 4-H Committee) to the Extension Office. We will register you for the conference. One important note: sessions fill on a first come, first served basis. This means that sessions will begin to fill over the coming weeks, so be sure to get your registration and fees back to the office as soon as you are able. Please have registration forms and payment in to the office no later than January 25, 2019. Happy Holidays from OSU Extension! Our office would like to wish you Happy Holidays and a Happy New Year! We look forward to serving your needs in 2019. Our office will be closed on Monday, December 24th and Tuesday, December 25th as well as Tuesday, January 1st. Otherwise, our office will be open normal business hours. Happy Holidays from Adrienne, Dean, Lori, Shari, Julia, Lu, Kim, and Lisa! We would like to welcome our new colleague, Kim West, to our office. Kim will be supporting all program areas, answering the phones and greeting and helping customers when they come to the office. You can read a little bit more about Kim below. 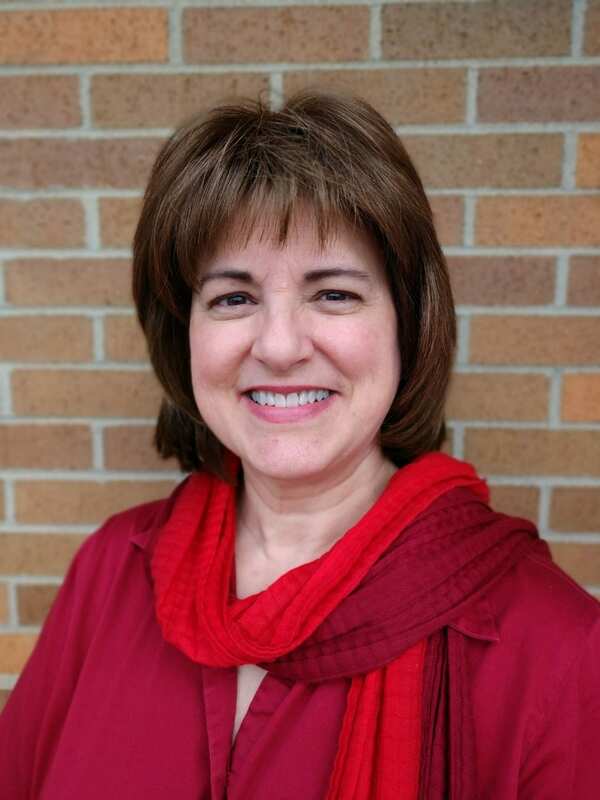 When you call in to our office or stop in, please be sure to welcome her to the OSU Extension family! We are so happy to have her as part of our team. 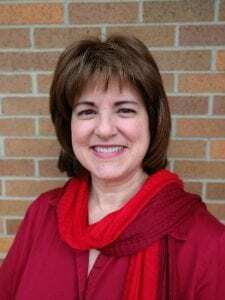 Kim West is from the Central Ohio area and currently lives in Granville, Ohio with her husband Terry, a retiree from The Ohio State University. Kim has a business background as both an owner and director for twenty years. More recently, she has enjoyed working in government and comes to the Extension Office with nearly eight years of experience in higher education. Kim’s adult children, Robert (DeVry University B.S. Computer Information Systems), Meagen (Kent State University B.A. Marketing), and Kelly (senior Denison University) live in central Ohio as well. In her leisure time, Kim volunteers for area churches, senior living, and animal rescues. Of course, the animal rescue work has resulted in having having three wonderful pups who rule their home! Is your kid inspired to learn by doing? Reba McEntire, 4-H alumni and award-winning singer, knows how important it is to empower kids to do, learn and grow in every community in America. As an Oklahoma 4-H’er, Reba learned resilience, compassion and the value of hard work through life-changing experiences that shaped who she is today. Share your #MyBootsDo story! Submit a photo and caption by December 28 showing how you or your kids are inspired to put on your boots, roll up your sleeves and get things done in your lives or your community for a chance to win a pair of REBA by Justin™ boots! You must be 18 or older to enter the sweepstakes, and entrants submitting their child’s story must be the parent/legal guardian of a child age five (5) years or above.